A tiny island out in the western Pacific Ocean, Guam is an unincorporated and organized territory of the United States. It's part of Micronesia, a collection of thousands of little islands. There's a lot of history behind Guam, with the island famously playing a crucial role in World War II and remaining an important United States military position in the modern day, but the island is now mostly regarded as a prime tourist destination, attracting huge numbers of visitors each year due to its gorgeous landscapes and pristine coasts. 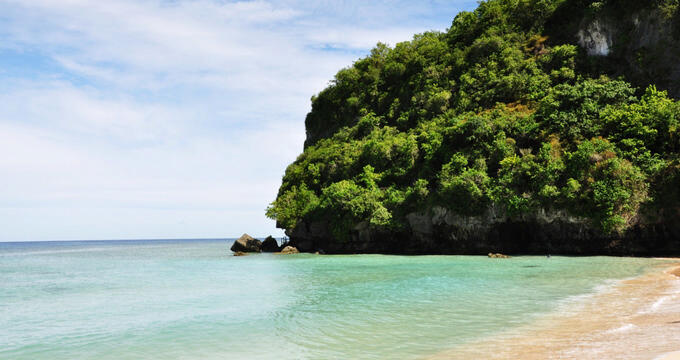 With the Philippine Sea to the west and the Pacific Ocean on the east, Guam has a long shoreline and a lot of awe-inspiring beaches for visitors and residents to enjoy. The island also enjoys a tropical rainforest climate with exceptionally high temperatures all year long, so it's a wonderful place to visit during any month of the year. Even when it's cold and frosty elsewhere in the world, the sun is always shining on Guam, making this a prime destination for people who want to kick back and relax on the soft sands or take a dip in the warm waters all around. Despite being a small island, Guam boasts a long list of beautiful beaches that are suitable for all kinds of activities. No matter where you happen to be on this little Micronesian island, you’re never too far away from a sandy haven. If you’re planning a Guam vacation and want to visit the best beaches on the island, read on to learn all about them. Despite the name, the chances of actually seeing sharks at this Guam Beach are very low. In fact, scuba diving and snorkeling are actively encouraged at this beach and it's known for offering some spectacular underwater views if you have the courage and equipment to head out on the water and beneath the waves. Due to the rocky nature of this beach, however, it's a good idea to bring some protective footwear along. In addition, Shark's Cove isn't the easiest Guam beach to access. You'll need to hike for a little while along a coastal path to get here, but it's certainly worth the trip. This Guam beach has a lot of history behind it, being one of the two main locations targeted by the United States military forces as they attempted to reclaim the island from Japanese invaders back in World War II. Due to its past, the beach is home to several memorials and monuments to teach people about what happened and honor those who fought and fell here. As well as being a hit with history buffs, this Guam beach is quite simply a lovely spot to stop off on the island. It's got a nice surrounding park area with lots of grassy patches and palm trees, perfect for picnics, and the sands are nice and soft. This uniquely named beach is found on the northwestern shore of the island and is a super spot for diving and snorkeling at any time of day. The beach was named due to the presence of an old gun which is still standing and can be touched and photographed by interested visitors. There's a pretty little lagoon here and Gun Beach provides some spectacular views of various landmarks around this part of Guam's coastline like Two Lovers Point. A bar can be found at this beach serving up cocktails and tasty snacks too. Not too far from Gun Beach is Matapang Beach, and this is one of the top spots for families in Guam. It's a very safe beach, with a lifeguard always on duty and keeping watch over the water to ensure that everyone stays safe. The waters can vary here but are often quite calm and always very warm, so it's a super spot to do some wading or paddling with little ones, or even head out for a deep sea swim if you're in the mood. This Guam beach is also known as a popular training spot for local rowing enthusiasts, and it can be very relaxing to simply sit back on the sand and watch them paddling past. Tanguisson Beach is one of the best beaches in Guam for people to gather together with friends or family and enjoy some food while looking out at the incredible ocean views. Lots of picnic tables are found at this beach and there are several grill pits open for public use too on a first-come, first-served basis. It's also quite a romantic little spot, so it's a nice place to come if you happen to be on your honeymoon or a couple's getaway. If you don't necessarily care about soft sands and sunbathing, Talafofo Beach will appeal to you. This is a rocky location, so it's not very suitable for lying down and soaking up the sun's rays, but it's a big hit with active tourists who like to explore. There are some pretty rock formations to be found here and a lot of lush vegetation providing the perfect backdrop for some vacation photos. This beach, which is situated in the southeastern part of Guam, is also conveniently located to the nearby Talafofo Falls Park, filled with waterfalls and secret caves that can bring out the adventurer in anyone.